Poll: Do I open these stupid Amiibos? 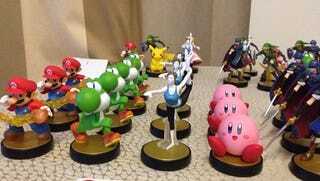 I have too many Amiibos. I don’t even understand at what point I accrued so many; I paid $30 for one (Charizard), but paid MSRP for the rest. I have Marth, Ike, Sanic, Samus, Mega man, Captain Falcon, Donkey Kong, Lucario, Bowser and Charizard. I honestly want to open them, but stupid “but they are money worth!!! !” thoughts are penetrating my skull. I think people who leave things packaged are stupid... And yet I still have them packaged. So what do? Despite my objection to stupid, static, plastic toys, I want to make things infernal little hellshits looks good in a display case. ._. I am hypocrite scum. Also, in searching for how to embed a poll, I found a great article going over Kinja formatting. I bookmarked it. It’s really useful! Didn’t know such a thing existed. In other random nonsense, I found out that a motel stole my credit card information (and charged me for stays I never booked or agreed to), I went to a photo studio that kept telling my fiancee to be “fun” and “dynamic” when we were just looking for formal engagement shots (we both agreed to walk away and decline to purchase anything about halfway through the shoot), my TV died last night and I replaced it, and other stuff. Misery. Sorrow. Arby’s. Etc.